About 10 years ago, I met a woman I’ll call Hilda – the mother of an in-law – who told me that sometime around 1981, while watching television, she had the sudden urge to start writing a story – a story having to do with outer space. She had no real interest in the subject and had no prior interest in creative writing. “But I felt compelled to write,” Hilda told me. Words began flowing from Hilda’s pen, including many technical words that had no meaning to her. Her husband retired for the night and when he awoke the next morning Hilda was still writing. “I had lost track of time,” she explained. “I had no idea it was already morning.” She did not know what she had written, and when she read it she didn’t completely understand it. When Hilda mentioned her strange experience to her fundamentalist pastor, she was informed that whatever was happening to her was demonic and that she should immediately desist, which she did. About 10 years later, when she was around 60, Hilda suddenly discovered that she had artistic ability. Although I am no judge of art, her paintings certainly indicate exceptional talent. Hilda decided to polish her painting skills by enrolling in some art classes. 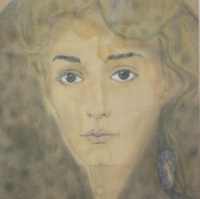 However, when she realized that the classes were negatively affecting her artistic ability, she discontinued them. My guess is that Hilda is a natural medium and that the initial writing experience was automatic writing – a spirit using her hand while she was in an altered state of consciousness. Considering the fact that she had displayed no previous artistic ability, the paintings also seem to have been directed by a spirit. The fact that the classes negatively affected her ability seems to lend itself to this theory. That is, the artist in spirit did not want to change his style. 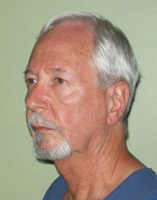 Nine years later, during 1969, Paul was exploring mediumship in a spiritualist church in Montreal, Quebec and was given a personal demonstration by a medium who claimed to work with a group of spirits calling themselves “Tonancas.” The medium asked his spirit guide a number of questions about Biscop, including names of deceased relatives and the name by which Biscop was known in the spirit world. “Unfortunately neither the names of deceased relatives, nor the names by which I was supposedly also known in spirit, made any sense to me,” Paul continued the story. “One detail, though, was interesting. I was told that I was also known by a name, ‘that was held dear to my mother’s heart,’ the name ‘Andrew.’” When Paul later asked his mother about the name, it made no sense to her, either. Thompson had met Gifford some years earlier in the marshes of New Bedford, Massachusetts, as he was hunting and Gifford was sketching. Thompson recalled talking to Gifford for a few minutes on one occasion and just seeing him on a couple of other occasions. Also, he once called on Gifford to show him some jewelry, but that was the extent of their contact. During the latter part of January, 1906, Thompson saw a notice of an exhibition of Gifford’s paintings at an art gallery and went to see them. While looking at one of the paintings on exhibition, Thompson heard a voice in his ear saying, “You see what I have done. Can you not take up and finish my work?” It was after that that he learned that Gifford had died on January 15, 1905, some six months before he developed the interest in painting. When Thompson showed one of his paintings to an art connoisseur, he was told that it resembled the work of Gifford, even though Thompson made no mention of the Gifford influence. One vision of some gnarled oak trees especially haunted Thompson. He felt he had to find the scene and paint it. It was at this point that he contacted Hyslop. He sketched the gnarled oak trees for Hyslop (below), stressing that the need to find the trees and paint them was overwhelming him and causing him to lose interest in his job. Since Hyslop had been studying mediumistic phenomena, he arranged to have Thompson sit with three different mediums. All three described someone present who was said to be fond of painting, although none of the three could get his name. One of them did, however, get his initials, R.S.G., for Robert Swain Gifford. One of the mediums described a group of oak trees, which Thompson recognized as those that he had been visualizing for over a year. She could not give a location, but said that one had to take a boat to get there and that it was near the ocean. The second medium also described what she said looked like gnarled old trees near the ocean. A number of other facts suggesting Gifford were also communicated. Thompson then went to the Elizabeth Islands and found the gnarled oak trees on the island of Nashawena, a place he had never been. 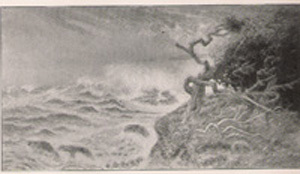 He immediately painted the scene ( below). He also found several other scenes he had sketched or painted. While viewing one of them, he heard a voice similar to the one he had heard at the art gallery say, “Go and look on the other side of the tree.” There he found Gifford’s initials carved in the bark of a beach tree in 1902. 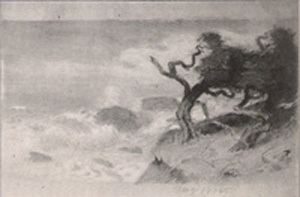 While skeptics might claim that Thompson made up the whole story and that he actually visited the scenes beforehand and made the sketches he claimed came from his visions, Hyslop saw no motive for such a charade, nor could fraud explain how Thompson suddenly became an accomplished artist with no prior experience or training. Most of all, though, Thompson had no control over the sittings with the mediums, which were arranged and observed by Hyslop. If Thompson had been faking it, how did the mediums come up with so many similar hits? One of the real curiosities of trance mediumship, especially that of yesteryear, is the abundance of Red Indians serving as guides, or, as they are more often referred to, “controls.” Red Cloud, Silver Birch, Red Jacket, Sunflower, Silver Belle, Shenandoah, White Eagle, Silver Star, Chloe, Kokum, Hawk Chief, Chlorine, and Big Horn are some of the guides or controls who come to mind. There were many “controls” without Red Indian names, but the Indians seemed to have a disproportionately high representation. Recently, however, there have been many interesting reports coming from observers of a group in Montcabirol, France known as the Yellow Cloud Circle. The mediums are Tom Morris and Kevin Lawrenson. Isabelle Duchene of Belgium reported on her sitting with the Yellow Cloud Group at her web site. She states that she was allowed to take a psychic photo (meaning she takes a picture when she feels or sees that the energy of the subject is present) of Yellow Cloud. 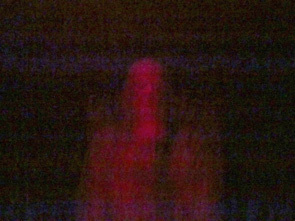 She further explains that when she took the picture, (with a normal small digital camera) the medium, (who in this case was Kevin Lawrenson) was sitting in the cabinet with the curtain open; the room was dark other than a red light was on. When she looked through the view finder on the camera she saw Kevin sitting in the chair, but when the picture was developed it was as below. The second duty is to act as an intermediary on the spirit side, passing on messages from spirits who do not know how to communicate through a medium. In the intermediary role, the control is a medium on that side of the veil, interpreting messages from other spirits and passing them on through the earthly medium to the sitter. Just as few people on this side can communicate directly with spirits, few spirits can communicate directly with those on this side. In effect, the communicating spirit gives a message to the “control” who sends it through the earthly medium to the person sitting with the medium. There are also some controls, although “guides” may be a better word for them, who are not so much intermediaries as they are teachers. They are more advanced spirits who come to teach higher truths. Silver Birch and Red Cloud were examples of this type, although Red Cloud seems to have functioned both as an intermediary and as a teacher. Speaking through trance medium Anna Wickland on March 12, 1924, Silver Star, Anna Wickland’s primary “control,” told Dr. Carl Wickland, a Los Angeles psychiatrist and Anna’s husband, that mediums so often have Indians as controls, guides, or helpers because Indians have no beliefs or dogmas to overcome when they pass to the spirit world. So many “pale faces” are grounded in materialism and handicapped by religious dogma and doctrine that they do not know how to control “Nature’s forces.” Unfettered by materialistic attachments and religious dogma, the Indians are able to make a much better adjustment after they transition to “The Happy Hunting Ground” and to “tune in” to various vibrational levels because they have learned to be one with nature during their earth lives. “Some people think Indians do not know anything because they have not had much schooling,” Silver Star added, “but they have true love for The Great Spirit and a true love for helping others.” Another of Mrs. Wickland’s controls was Movilia, who had been an Eskimo medicine man of high order with a profound knowledge of nature. The communicating entity further explained that Silver Birch was his medium on that side, just as Barbanell was the medium in the world of those in attendance at the séance. “I had to have what in your world would be a transformer, someone through whom the vibrations can be stepped up or slowed down so that I can achieve communication on your level,” the entity explained. When they are not Indians, they are often young children. “When a spirit who has lived to an old age on earth acts as guide, through his contact with matter he is apt to sense his last physical condition and this often leaves an old and tired feeling with the medium, while children bring a youthful magnetism,” Dr. Wickland was told by a communicating spirit. When scientists and scholars began investigating the mediumship of Leonora Piper, a Boston, Mass. trance medium, back in 1885, they jumped to the conclusion that her primary spirit control, identifying himself as “Dr. Phinuit,” a former French holistic physician, was a secondary personality buried in Mrs. Piper’s subconscious, as they could find no record of Phinuit having existed as a human (although many records which may have verified his existence were destroyed during the Franco-Prussian War of 1870). Somehow, they reasoned, this secondary personality could tap into the minds of sitters and feed information back to them. When information came through that was unknown to the sitters but later confirmed as fact, the researchers broadened the telepathy hypothesis by suggesting that the secondary personality could access minds anywhere in the world and even dip into some cosmic reservoir for information, then somehow organize all of the data and carry on a conversation with the sitters and the researchers. Any hypothesis, no matter how far-fetched, was preferable to spirits, as believing in spirits would have meant a return to religious superstition in an age of enlightenment. But then a spirit named “George Pellew” started taking over from Dr. Phinuit. Pellew had just died in a fall a few months earlier and was known to Dr. Richard Hodgson, the chief researcher. He gave every indication of being the same George Pellew that Hodgson had known. Hodgson and many other researchers then abandoned the secondary personality hypothesis and moved to a belief that the spirit control was just what it claimed to be – the spirit of a dead person. . But many modern parapsychologists see the secondary personality hypothesis as more acceptable because it “more scientific.” What none of them seems to be able to explain, though, is why all of these secondary personalities are liars. Why are all claiming to be spirits of the dead? Or to put it another way, why is the subconscious trying to trick the conscious and the sitters into believing it is the spirit of a dead person – Red Indian or otherwise. It is one thing to believe that a few minds are so warped as to play tricks on the conscious self and others, but it seems highly unlikely that all minds want to play the same game with the conscious self. If so, they must be in some way programmed to carry out the imposture. If that is the case, who programmed them all? If God did the programming, why is He, She, or It trying to trick everyone into believing in spirits? It simply doesn’t make sense.